Cher just doesn't quit. At 67 years young, the singer and Oscar-winning actress has been on the road with her "Dressed to Kill" tour, but she's not close to retiring. In fact, as she revealed exclusively on TODAY Wednesday, she's adding 27 new shows to the current lineup. "When I'm on that stage, I'm doing my job," she told TODAY's Tamron Hall. "That's my only job, just to take you out of yourself, be part of this huge collective. We all kind of come together as a group. We forget that we're separate." She's jokingly described this tour as her "farewell farewell" tour, referring to the fact that she already made hay out of retiring with her 2002 to 2005 "Living Proof: The Farewell Tour." And the truth is, she seems to love touring so much it's hard to imagine her ever giving it up entirely. This time, she's even brought late husband and onetime performing partner Sonny Bono into the mix, showing images of him during the show and even duetting with those photos. "I thought I could never do that," she said, then added that she was able to do it on this tour because "I knew it was the last time. ... He'll be so excited to be onstage, 'cause he was such a ham." 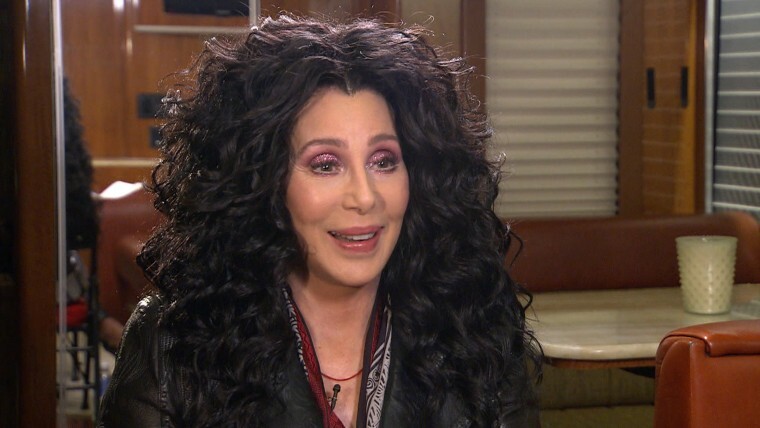 The truth is, Cher may love to perform, but she's just as happy to be a homebody. "I have this one kind of personality that loves to be with people and talk and whatever and sing and whatever," she said. "And I have this other personality that wants to sit and be quiet, watch old movies. ... I'm very much of an introvert, totally." Nonetheless, Hall was able to get the self-described shy performer to do something she'd never done before — appear in a selfie! Cher's album "Closer to the Truth" is in stores now. Her additional tour dates begin in September.